Sometimes, what you read on the internet is true. Like now! Nikon's D5000 is a 12.3MP DSLR that shoots 720p HD video using the D90's sensor for $850. Yep, the display is all swivel-y. Nikon D5000 Cheap DSLR With HD Video and Swivel Display Outed Next Week? It's got the same sensor that's in Nikon's previous HD-video-shooting D90, so you can expect the same image and video performance. Actually, it sounds like most of what we ran into with the D90's video recording stays true, so be sure to read our review for a taste of the pleasures (and pains) that apply. Describing it as the D90 Lite isn't so far off: It's smaller, not quite as fast and is missing the Speedlight commander, but has beginner stuff like teaching menus and 19—yes, nineteen—scene modes, from the usual suspects like Sports to more random, like Candlelight. It does have the same 11-point autofocus, 100 to 6400 expanded ISO range, and 720p video at 24fps as the D90 though. The vari-angle display is 2.7 inches, a little smaller than 3 inches I've gotten used to on Nikons, but I suppose that's the price for freedom. The D5000 has four Live View autofocus modes, including a new Subject Tracking AF that locks onto a moving targets like cats and sugar-powered rugrats. It's interesting that Nikon and Canon have both made the same play at the exact same time: Pulling a sensor from a pricier mid-range camera and stuffing it into an entry-level DSLR with HD video recording. Clearly, they both have a similar sense about the direction of DSLRs, and it looks like the first real battleground is going to be in the lower levels. (Which is good for us, since it means the pricing should get nice and bloody.) For the record though, we're still waiting on that D400 with 1080p video capabilities. MELVILLE, N.Y. (April 14, 2009) – Nikon Inc. today introduced the new D5000, a digital SLR camera with a host of features and capabilities that deliver superior performance and image quality along with amazing versatility for photo enthusiasts and those new to digital SLR photography. Leveraging Nikon's expertise and innovative technologies found in its pro-level D-SLRs, the 12.3-megapixel D5000 enables users to capture exceptionally stunning images and High Definition video with remarkable ease. Whether consumers are progressing from a point-and-shoot digital camera or looking to upgrade their current digital SLR and elevate their photographic expression, the D5000 serves as an ideal solution. First time D-SLR photographers will appreciate logical and easy-to-use controls, while creative enthusiasts will appreciate the D5000's robust combination of features, technologies and performance. The D5000 boasts a versatile 2.7-inch Vari-angle LCD monitor that encourages shooting with a fresh perspective, Nikon's revolutionary D-Movie Mode and expanded automatic Scene Modes, delivering superior Nikon innovation in a compact, user-friendly design. "The Nikon D5000 represents a cornerstone in Nikon's D-SLR line, marrying simplicity and instructive features with superior technology and HD video, allowing the user's ability and creativity to grow-with the camera," said Edward Fasano, General Manager for marketing, SLR System Products at Nikon Inc. "While its easy-to-use design will attract first-time D-SLR photographers, the D5000's rich feature set and high performance will also appeal immediately to more experienced enthusiasts. The D5000 is sure to inspire creativity and originality." Photographers can easily compose stunning images on the Vari-angle LCD monitor that they can view in a normal position fitting securely within the camera back, or swung out to be rotated or tilted. The monitor can also be stowed with the LCD panel tucked against the camera back to protect the screen when not in use. This tremendous freedom of movement, along with four Live View autofocus shooting modes, affords users the opportunity to shoot from a multitude of imaginative angles. Easy one-button Live View activation now features Subject Tracking autofocus (AF), which automatically locks onto a moving subject. Even if the subject leaves the frame and returns, Subject Tracking AF maintains focus, making the D5000 ideal for capturing fast moving children and pets. 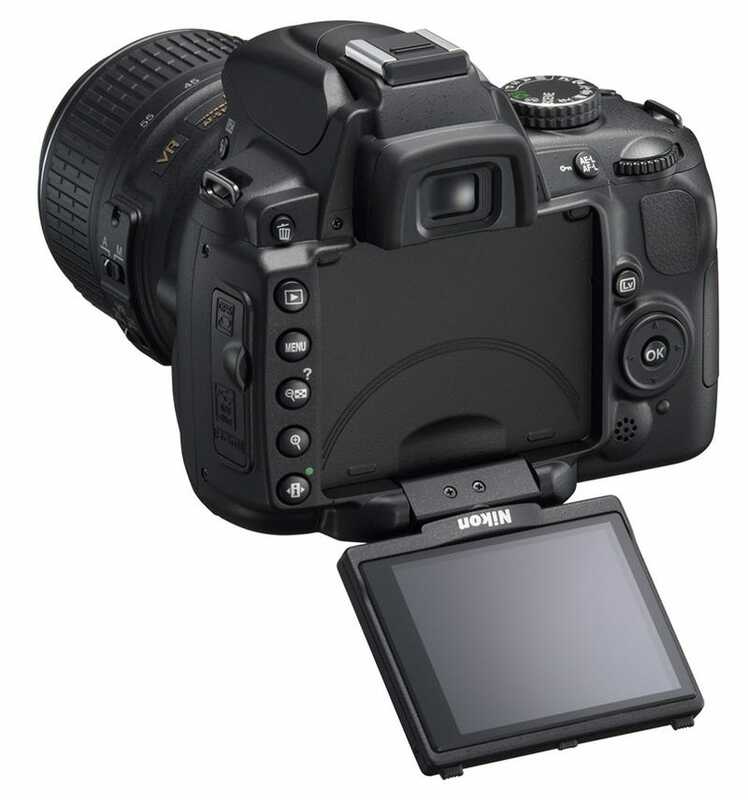 In addition to Subject Tracking AF in Live View, the D5000 features Face Priority AF, which automatically detects up to five faces in a scene and focuses on the closest subject; Wide Area AF, which offers a large AF area for optimal hand-held shooting; and Normal Area AF, which provides pinpoint accuracy when shooting with a tripod. The D5000's D-Movie Mode allows users the exciting ability to record HD movie clips (1280 x 720) at a cinematic 24 frames per second with sound. Photographers will appreciate the quality produced whether creating vacation clips or intertwining still photographs and movies in a post-production creative montage. Additionally, the D5000 is compatible with a comprehensive assortment of AF-S NIKKOR interchangeable lenses to provide users with the ability to capture perspectives not possible with typical consumer video recording devices. When using any NIKKOR VR lens, D-Movie clips benefit from Nikon VR image stabilization, which automatically activates during recording to deliver added sharpness and image stability. VR image stabilization also extends the D5000's performance in low-light situations. D-Movie clips are recorded onto an inserted SD or SDHC memory card and saved as Motion JPEG AVI files for easy editing with widely available video editing software. Further bridging the gap between point-and-shoot cameras and more advanced D-SLRs are the D5000's 19 automatic Scene Modes, which free users to capture beautiful images without having to manually adjust camera settings. With the broad range of automatic Scene Modes, including Sports, Portrait, Candlelight, Silhouette, Autumn Colors and more, D5000 is the perfect camera for anyone looking to make inspiring images in challenging photographic conditions. The D5000 also incorporates a comprehensive set of in-camera editing features to make the most of captured images without the need of a computer. The D5000 also introduces several new Retouch features, including a Soft Filter effect, which applies a smooth appearance to faces or the entire image; Perspective Control, which helps correct distortions in perspective often encountered in photographs of architecture; and Color Outline, which creates monochrome outlines of objects in images by eliminating color and tonal gradations. The D5000 saves each of these edited images as a separate JPEG file, ensuring the original image is left unmodified. With Nikon's exclusive Picture Control Settings, photographers can quickly select various image appearance profiles that include Standard, Neutral, Vivid, Monochrome, Portrait and Landscape settings. In addition, Picture Control provides the ability to create and store up to nine user-defined custom profiles to reflect each user's personal preferences for hue, color saturation and image sharpening. Extensive playback options allow users to review their photos in groups of four, nine, or 72 thumbnail images. Alternatively, users can select the Calendar View to easily group and select images by date. These playback features can be viewed either on the Vari-angle LCD or an HDTV with HDMI connectivity available via a dedicated HDMI port on the camera. Consumers will immediately appreciate the benefits of the D5000's 12.3-megapixel CMOS sensor coupled with Nikon's exclusive EXPEED™ image processing system, which delivers highly detailed images with vibrant color reproduction and low noise across a broad ISO range. The D5000's normal ISO range extends from ISO 200 to 3200, allowing for superior shooting in low-light conditions. Additionally, the D5000's ISO range can be expanded to a Lo 1 setting of ISO 100 or a Hi 1 setting of ISO 6400, furthering the opportunities for previously impossible shots. Nikon's exclusive 3D Color Matrix Metering II, in conjunction with the EXPEED image processing system, contributes to the D5000's ability to capture breathtaking images by instantly evaluating the exposure elements of each scene and comparing it to an onboard database of information from more than 30,000 images. These split-second calculations allow the D5000 to ensure the right exposure-even when conditions are extreme. To push creative boundaries even further, the D5000 allows picture-takers to also use Center-Weighted and Spot metering for added personal control. The D5000's 11-point auto focus system utilizes Nikon's exclusive Scene Recognition System with Face Detection to help create the best possible images in a variety of shooting environments. Nikon's 11-point AF offers best-in-class speed and accuracy, helping to ensure sharp focus, shot-after-shot. Single-point AF is suggested for static subjects, Dynamic-area AF for moving subjects, Auto-area AF for spontaneous shooting and 3D-tracking with 11 AF points for maintaining accurate focus on a subject moving throughout the frame. The new D5000 also features the innovative Integrated Dust Reduction System, which offers both an electronic sensor cleaning when the camera is powered on and/or off and the Airflow Control System, which directs dust away from the sensor with every snap of the shutter. These functions work to clear image-degrading dust from the sensor's optical low-pass filter, helping to ensure spot-free images. In addition, the D5000 features a Quiet Release Mode that reduces the mirror cycling noise for discreet shooting in sensitive situations, such as weddings and other ceremonies. Photographers and enthusiasts alike can also appreciate the D5000's system expandability, as the camera can work in conjunction with a variety of Nikon accessories including a broad assortment of NIKKOR AF-S interchangeable lenses. While the D5000 offers a versatile built-in flash, the camera is also compatible with Nikon's Creative Lighting System and capable of Advanced Wireless Lighting when using the SB-900 Speedlight or the SU-800 Wireless Commander. For those looking to document their photo excursions with geo-tagging, the D5000 is compatible with the optional GP-1 GPS Unit, which automatically records latitude, longitude, altitude and time information when a picture is taken. The D5000 also works seamlessly with Nikon's powerful Capture NX 2 image editing software (available for purchase separately), for more advanced photographers seeking greater control over their post-capture images. Capture NX 2 simplifies the path to beautiful images with easy-to-learn editing tools and a highly versatile and elegantly simple interface, which streamline editing procedures. The D5000 outfit, which includes the AF-S NIKKOR 18-55mm f/3.5-5.6G VR lens, will be available at Nikon Authorized dealers beginning in late April 2009 at an estimated selling price of $849.95**. For consumers who want to configure their D5000 system or for photographers who need an additional D-SLR body for an existing system, the D5000 will also be offered as a body only for an estimated selling price of $729.95. For more information, please visit www.nikonusa.com.